DALLAS & MCLEAN, Va.--(BUSINESS WIRE)--The Statler, an iconic downtown Dallas hotel, opens today as part of the exclusive Curio Collection by Hilton, one of Hilton's 14 market-leading brands, following a $255 million redevelopment. Centrally located, The Statler symbolizes the heart and soul of Dallas and was hand-picked to join the collection of one-of-a-kind hotels and resorts that are integral parts of the destinations they call home. The Statler is also part of Hilton Honors, the award-winning guest-loyalty program for Hilton's 14 distinct hotel brands. Members who book directly have access to instant benefits, including a flexible payment slider that allows members to choose nearly any combination of Points and money to book a stay, an exclusive member discount, free standard Wi-Fi and access to the Hilton Honors mobile app. For more information or to make a reservation, travelers may visit www.thestatlerdallas.com or call 214-459-3930. Media may access additional information on The Statler, Curio Collection by Hilton at news.curio.com/statler. 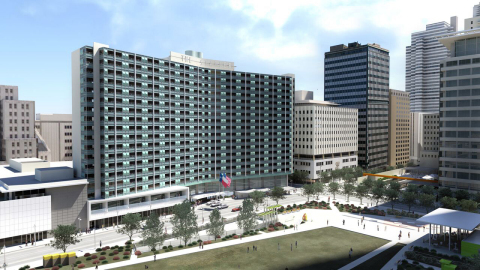 The Statler is a modern-day redevelopment of a landmark Dallas hotel set to open in 2017. Opening its doors for the first time in 16 years, The Statler will feature a luxury boutique hotel and residences, with restaurants, nightlife, boutique retail, meeting spaces and a multi-purpose events and concert venue. Encompassing style, status and sophistication, The Statler features 219 luxury residences and 159 hotel rooms. Originally opening as the Statler Hilton in 1956, the hotel was a destination for the elite, attracting the world’s most distinguished dignitaries and celebrities. The Statler, part of Curio Collection by Hilton, is the iconic downtown Dallas experience. Curio Collection by Hilton (curiocollection.com), launched in 2014, is a global portfolio of more than 40 remarkable, upper upscale hotels and resorts handpicked for their unique character and personality. Curio Collection properties appeal to travelers seeking one-of-a-kind discoveries and authentic experiences, all backed by Hilton (NYSE: HLT) and its award-winning Hilton Honors program. Read the latest Curio Collection stories at news.curiocollection.com, discover Curio Collection destinations through Cities by Curio itineraries at citiesbycurio.com and connect with the collection on facebook.com/curiocollection, instagram.com/curiocollection and twitter.com/curiocollection.